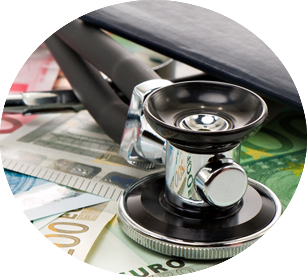 Hospitaly provides patients different payment options with detailed pricing for all treatments as possible. We want our patients to have a complete understanding of the many payment options Hospitaly offers and their medical costs upfront, to avoid any unexpected or unpleasant surprises down the road. We welcome individual patients without insurance, employer assisted patients and patients with private medical coverage from many major insurance companies. Hospitaly accepts cash payment in US dollars and Euros by the daily exchange rate. Hospitaly accepts debit cards (3% Commission charge). If paying by debit card, please contact your bank in advance to ensure that your daily debit allowance is enough to draw out the full amount for your procedure. Hospitaly accepts all major credit cards, including Visa, MasterCard, American Express and Discover Card (3 % Commission charge). If you are paying by credit card, make sure you have enough available credit to pay for your procedure. Inform your credit card company of your upcoming purchase so they will know to accept the transaction. There are no fees placed on credit cards by the hospital, although your credit card company may impose its own credit card fees and/or currency conversion rates. Contact your credit card company to find out more information about these charges. Hospitaly accepts payment via wire transfer. You may transfer your payment via your bank or online banking. Please note that the transfer must be made five business days prior to the required payment date in order to be credited to your provider’s account. Your bank may charge you a one-time transfer fee. Please contact your bank regarding any fees. *Hospitaly is not affiliated in any way to the aforementioned companies and is not responsible for the agreements made between these companies and patients. Our international staff will assist you to coordinate with your insurance provider regarding the approval of payment for your medical expenses (excluding personal expenses). Patients should familiarize themselves with the terms of their insurance coverage. It is important to understand which hospital services are covered by your insurance plan. Complete insurance information must be submitted during your admission. No insurance claims will be submitted once the patient has been discharged. Patients without insurance will be responsible for payment of the hospital bill. Hospitaly accept most domestic and international insurance companies. If an employer or insurance company will pay your bill, a letter of guarantee and a copy of your identity or policy card from the employer or insurance company should be submitted upon arrival at the hospital. For out-patient procedures, advance payment may be required. The hospital will issue a medical report and invoice for you to process the reimbursement directly with your insurance company when you return home. Hospitaly accept most common forms of payment, including cash, credit cards (VISA/Master Card/American Express), wire transfers, debit cards, traveler’s checks and PayPal. Personal checks are not accepted. Passport and a copy of your passport with signature. Current medical insurance certificate or card. Hospitaly assists patients from around the globe. Our international patients have a variety of insurance policies and coverage. We assist our patients to coordinate reimbursement with their insurance providers.